Will they invest in in-house capabilities, will they outsource, and why? What needs to happen for 3D printing of end-production parts to become a large-scale reality? What materials are of greatest interest? If your company is a committed user of 3D printing, these findings will provide assurance that you are headed down a similar path of your peers and face many of the same challenges to adoption. If you’re still dipping your toe in the water, the results may serve as a wake-up call to take swifter action. 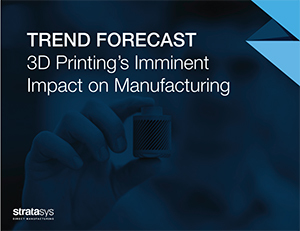 Using 3D printing to manufacture products may just be emerging as a competitive advantage today, but companies that don’t initiate investment soon will quickly be at a considerable disadvantage.